A present to rival the ambassador’s golden tower . . .
That’s not to say it’s not just a little bit naff, but surely that’s the joy of a Ferrero Rocher? Turn up to a dinner party with a box of them and your host may well turn up their nose (these aren’t quite quite Earl-Grey-infused single estate cocoa truffles), but I can think of few people who can resist the guilty pleasure of unwrapping the golden foil, popping one (or three) of these little treats in their mouth, and biting into their smooth, crispy crunch. The Ferrero Rocher came into the world in 1982, just a couple of years before I did. While I was learning to walk and talk, these chocolates were establishing themselves as the height of eighties sophistication; pyramids of golden balls sitting proudly alongside hedgehogs of tin-foiled grapefruit pierced with cheese on a stick. Nowadays we might smirk at what passed for chic in those distant shoulder-padded days, but with over 3.6 billion Ferrero Rocher produced worldwide in 2010, I think the Ambassador might just be having the last laugh. Just one is never enough . . . 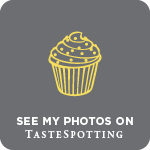 If you’ve read this blog recently, you’ll know I’ve become slightly obsessed by hazelnuts; from cupcakes to frosting, ice cream to brownies and everything in between, incorporating a sprinkle of nuts here and a dollop of Nutella there. A couple of weeks ago, one reader (aka the incredibly talented Procrastobaker) mentioned her addiction to Ferrero Rocher, and the idea of a homemade version started to take seed. Coated in crispy wafer & waiting for a chocolate coat . 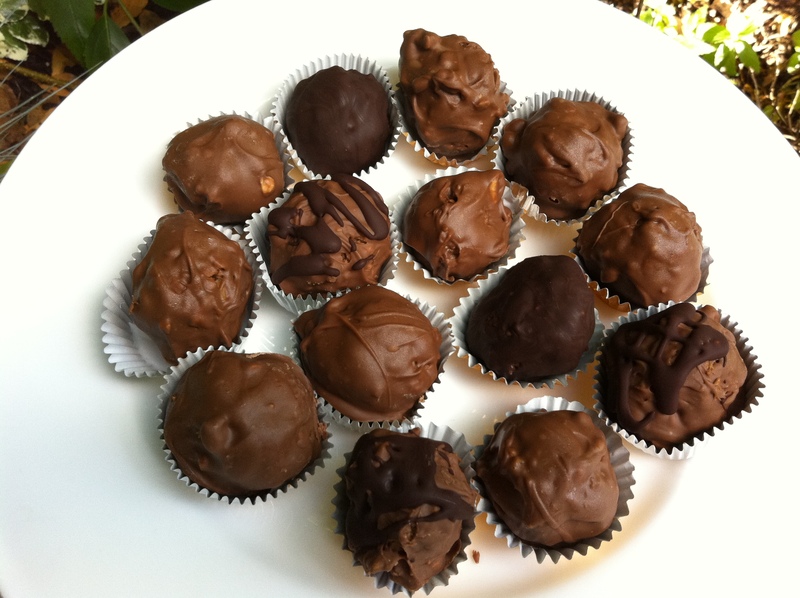 . .
Head online and you’ll find a number of different recipes for Ferrero Rocher. Two of the highest ranking results are in Serbian (although they substitute Nutella with the less appetisingly named Eurocrem) but even armed with my Google translator I couldn’t quite make sense of the detail; a shame as the accompanying photos are truly gorgeous. Recipes from My Food Obsession and Almost Bourdain proved a little easier to follow, although the latter incorporates a few too many chopped nuts for my liking, losing the creamy swirl of Nutella against the whole nut centre. My version below is a combination of the two, but have a play around to find the ratio of ingredients you like the most; this recipe is fairly forgiving and pretty much any combination of Nutella, chocolate and nut will taste good. 250g good quality milk chocolateMethod:Preheat the oven to 175 degrees C. Spread the hazelnuts on a baking tray and toast for 10 minutes, shaking once half way through. Remove from the oven, leave to cool then rub vigorously in a kitchen towel to remove as much of the papery skins as possible.Put 30 whole hazelnuts to one side, then finely chop the rest. Put the Nutella in a small bowl and stir in half of the chopped nuts. Pop in the fridge to firm up – around one hour.Line a plate with baking parchment or tinfoil. Chop the ice cream wafers and mix with the remaining chopped nuts. Remove the Nutella mixture from the fridge and, working quickly, roll small teaspoons of the mixture into balls, pushing a whole hazelnut to the centre of each one. Roll each ball in the mixture of chopped nuts and wafer til fully coated then pop onto your prepared plate and freeze until firm – around one hour.Melt the milk chocolate gently in a bain marie then allow to cool to room temperature. Remove your chocolate balls from the freezer and, working quickly, drop a ball into the melted chocolate, coating completely. 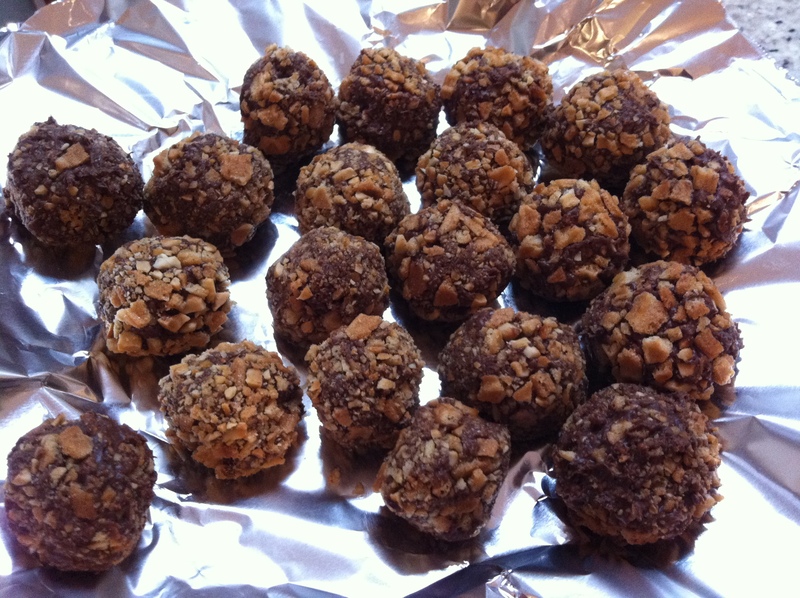 Because the balls are part frozen, the chocolate should firm up around them almost instantly. Repeat with the remaining balls then transfer to the fridge to set completely.Once set, place the chocolates in individual gold wrappers, stack into a pyramid and give the Ambassador a call. OK, now that’s going straight on my “must bake” list! Love it! 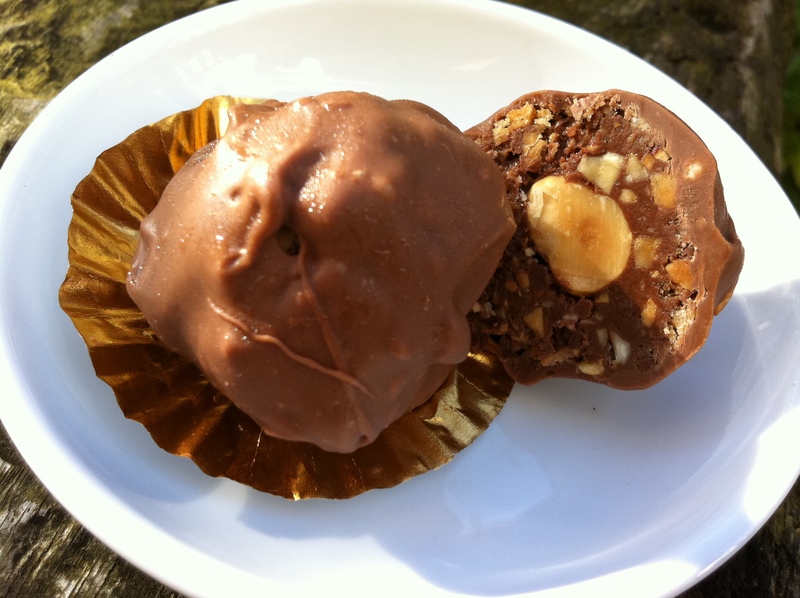 I never would have thought of making my own ferrero rocher but these like so much more appetising than the ones you buy – I always find the chocolate a bit wimpy so the idea of being able to decide how you want to cover them really appeals to me! Yum! oh my god this is so clever! They look utterly scoffable. Oh my God, this is brilliant! This is being bookmarked for Christmas – everyone is getting some. London Bakes – yep, you can adapt them however you want. I reckon a peanut & caramel version would be amazing…although obviously not really a ferrero rocher. Warm Snug Fat – haha, you are indeed the first to say it 🙂 enjoy! Frugal Feeding – thanks! Not sure whether my slightly mis-shapen versions could be stacked into a pyramid but I’d give it a go. Gin & Crumpets – homemade Christmas chocolates are absolutely the way forward! Gastrogeek – they’re totally scoffable which is dangerous. Four at a time. Minimum. I’m surprised to learn the Rocher candy has only been around since 1982 — the television ads are so iconic, burned into my brain from years of idiot-boxery as a child. These always seemed so rich and decadent and adult! The thought of making your own is brilliant, and thanks for sharing. I’ve recently fallen down the hazelnut rabbit hole myself, and I know these would be a huge hit to bring to a party (or to eat all by myself, while watching a cheesy movie. whatever!). I read every single word. Then went straight back to the top again to drool a little. I’m also going to have to hide this from The Hungry One- because if he sees it, I’m going to have to make it for him. Mmm, Nutella, nuts and more chocolate, who can refuse that combination?! Like the different combinations you’ve done. I have saved the link! I tried the FR challenge once, I failed miserably and only managed two in a minute! (To be fair, you can only eat one at a time, you can’t start unwrapping the next until your mouth is completely empty of the last so it’s not as easy as it sounds). With Milk and Flour – you can’t really go wrong with that combo! The dark chocolate ones are particularly good. Kavey – now that sounds like a challenge I want to try! Much better than the cream cracker challenge which is dry, impossible and generally not good! Oh these look incredible, yes, yes I am racing out for a jar of Nutella. Fantastic! They look much nicer than real ones. YUUUUUUM. I mean, seriously YUUUUUM. I love these! Awesome little gift idea – if they ever make it out of my house. Drooling over laptop here! *love* ferrero rocher, yours look so goooood! Don’t think would trust myself alone with these! 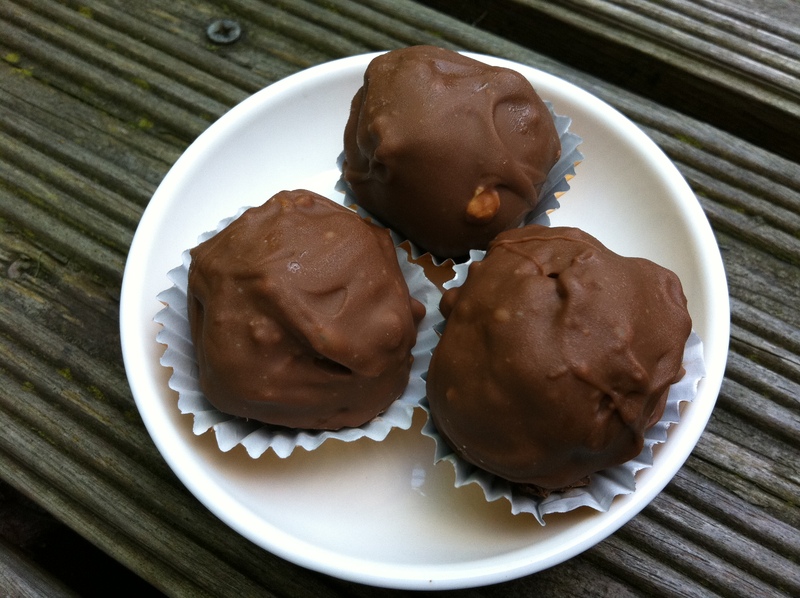 Wow, I have never thought of making home made Ferrero Rocher style truffles…great idea! 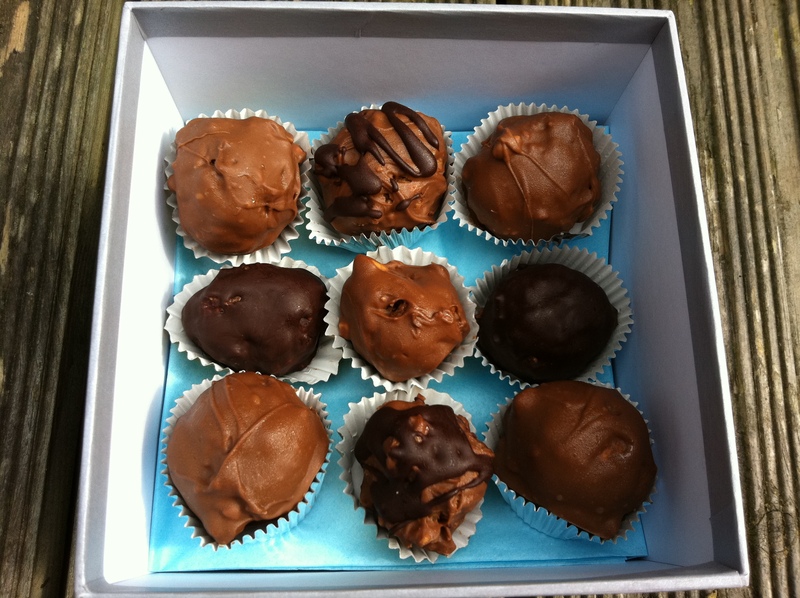 I love making my own chocolate and will definately try to make these ones too! Thank you!! ohhh yum yum, they look just like the rochers i ate in paris when i did an internship there in may! i have this recipe bookmarked, littleloaf! Oh, wowee zowee! These are gorgeous! I wonder if a GIANT rocher could be made? Greedy Diva – thanks! They’re perfect for a gift, but make sure you make a few extras! Katie – it’s all about hazelnuts for me at the moment. Am sure I’ll become obsessed by another ingredient soon though. Francesca – these are so much fun to make, and no complicated tempering of chocolate or anything so really easy too! Impressive! They look deadly professional… like you would find in a store. Hi, I am back and glad to be catching up on all your posts. Great job with these Ferrero Rocher. They look amazing! I remember when I had my first one (yeah, it must have been exactly in 1982) on a school trip and our teacher bought us one each. I remember biting into it and saying: hey, this is full of Nutella! At that age I never thought of the connection. Anyway, besides making it obvious how much older I am than you (well, not THAT much), it was good to take this walk down memory lane. Oh lord. Looks wonderful, must try to make these. Wonderful! Erin – I think it’s necessary to try more than one! Karen – ah, thank you! Mr. North – do give them a go! Maxine – they should keep for a pretty long time as there are no fresh ingredients as such. If you keep them in the fridge I reckon a couple of weeks, although as the chocolate isn’t tempered, if you keep the out the fridge they might melt. Hope that helps! Oh hell yes! I’m ashamed to say I was 1 when these puppies came out in 82, gah! I remember my mum always receiving some for Christmas. That’s when I’d get to have a few. I love them and they’re now ridiculously overpriced so am sooooo happy to find you’ve created a homemade version, yey!! How do they compare in taste? Is it pretty close? The strange thing about me is… I hate nutella, I dislike nuts by themselves. But put them together and BINGO, I love. Yes, I’m odd. I just found your lovely blog, what a treat. I’d love to make these, what are ice cream wafers? Thanks Dona! Ice cream wafers are the crispy biscuits you use to sandwich ice cream together. Crushed up ice cream cones would also work well! Well I read the whole thing and did not regret one word.. and I must say that these sound so easy I thought this was gonna be a couple page recipe and a lot of time but these sound easy easy and that is my kind of recipe indeed! Thanks for posting and I look to trying this very soon and maybe if they come out good enough ppl will be getting a little basket of these though it won’t be the Ambassador LOL 🙂 Love it! It blows my mind that you can make these at home! Never buying them again. Thanks little loaf. Anyway, I don’t eat sugar, but have already made homemade sugar free nutella, so this seems doable. Thank you for the recipe. Before I went sugar free, these were stunned if my favorite candies. Perhaps I’ll embark upon them for my birthday. You definitely should – would love to see a photo if you do! Thank you for such great recipe. Made for my girlfriend for Christmas. She loved it! Ooh yay, glad you enjoyed them!